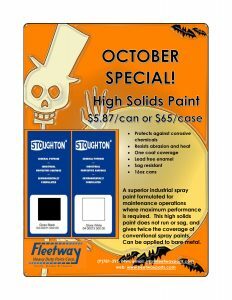 Fleetway Heavy Duty Parts is offering high solids paint, a superior industrial spray paint formulated for maintenance operations where maximum performance is required. This high solids paint does not run or sag, and gives twice the coverage of conventional spray paints. Can be applied to bare metal. We are offering this at a one time special price of $5.87 per can which is a $5 savings per can.